The photos on this page were taken in Fredericton, New Brunswick, Canada. In the area of Canada I visited September 2000, flagholders are very rare, but organizational and military insignia are inscribed on the tombstone itself. Black granite is very widely used for tombstones in the New Brunswick area of Canada covered by this trip. 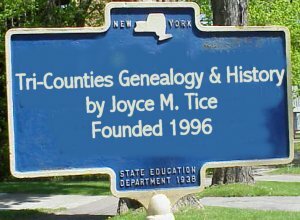 I am certain that identifying the above insignia found on the tombstone of a man who died in 1998 would have been extremely difficult. 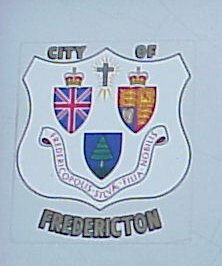 However luck was with me, and just down the street from the Fredericton Cemetery, I found a large park sign with the same crest all nicely labeled as that of the City of Fredericton. The man on whose tombstone this was found was probably a public servant in some office. The motto on his stone was "While we can, Let us do good." 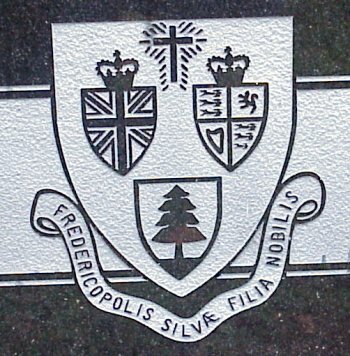 Crest of the City of Fredericton.